I captured this week’s photograph over the weekend while taking a walk along Hillsborough Street in downtown Raleigh. It is a picture of The Dodd-Hindsale House or as is it is more commonly known now, The Second Empire Restaurant. The restaurant’s name is a nod to it’s architectural style known as “Second Empire Victorian”. 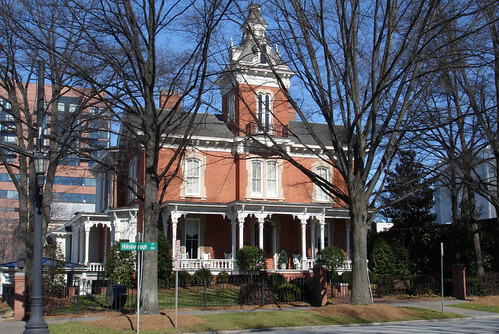 The home was originally built for Mayor William H. Dodd in 1879. You can read more about it’s history and it’s current dining offerings on the restaurant’s website. As I mentioned last week, if you have a photo you would like to have posted as the “Picture of the Week” please feel free to email me at TriangleExplorer@gmail.com. I could photograph the Second Empire for about two days. Right, I had a hard time picking out my favorite picture of that building. Every side of it offers something unique. I hear the food is very good, but I have yet to eat there!